The page lists the various satellite beams, with the map on the left and the television channels shown on the right. Clicking on the map links to the full-resolution satellite details on the satellite owner's web page. Both Freesat (fs) and Freesat-from-Sky (fSfS) channel numbers are shown, with radio stations and adult channels listed to the left. I cannot receive Movies4Men or Truemovies on my Echostar HDS-600RS Freesat HD receiver, can anyone explain why. I receive the movie channels on my Panasonic Freesat TV therefore it is not the signal. Chris : Go to menu,scroll to blind scan for FTA channels and press ok.
says "... broadcast from a number of different satellites" but does not say where those satellites are located (in degrees east or west). To somebody like me with a motorised dish this information is rather significant. Yes, obviously the information will be available somewhere else, but I would think this page is an obvious place to include it. What has happened to my freesat in Northern France ?? I had good reception then after several months some of the channels dropped out or had to be viewed on other Chanel's ( bbc 2) went to bbc NI... Then last week it all dropped out... Any reason you can think of.. Dish is very firmly fixed..
Andrew: What size of dish have you got? 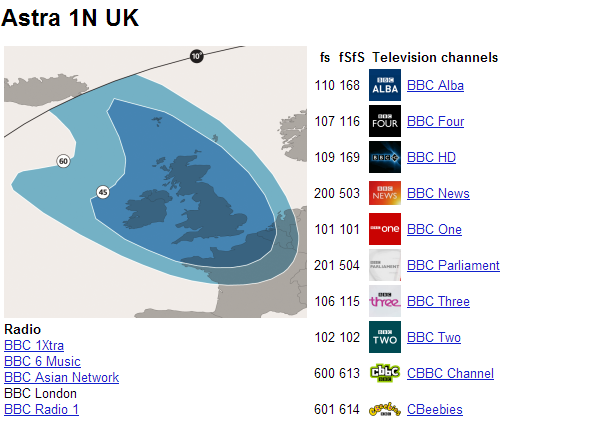 All should be well in Northern France as it's in good view of the Astra 2 UK footprint overspill. A bigger 60cm dish may help if you are losing out on a small 35cm minidish. Rob: The issue here is that satellites have or are being introduced by Astra and Eutelsat that have fixed and moveable "Spot" beam capablity which are able to concentrate signals focused on a particular country. There is overspill but not at the level that used to be, thus as far as ex-pats living in Spain and Portugal in particular are concerend they may no longer receive UK TV reception and this applies to ITV SKY etc. However it may still be possible to achieve reception in some areas, but this is likely to incur financial outlay e.g. upgrading Dish size and perhaps LNB. Anyone conteplating this would be well advised to have this assessed by a local or ex-pat fitter in the country where they are residing, before any financial outlay. We have for a few years have been able to get all BBC and ITV channels in Southern Italy via Freesat until recently, when we returned ths June to find allwas gone, except Sky News and other Movies for Men and a few others after searching the various channels. After speaking to a local TV installer he showed us an article in a magazine (in Italian) which mentioned that the Freesat footprint had been reduced to cover the UK and Northern France. Question is, who and why was this decision taken and will the service ever be reinstated? Terry Heard, UK national channels (which are subject to geographical restrictions and programme rights issues) on Astra 2E/2F/2G at 28.2degE transmit on a tight UK spotbeam which covers the United Kingdom with a very limited overspill to NW Europe, while commercial free to air channels on those same satellites with no programme rights issues use a Pan European widebeam which covers much of Mainland Europe as well as the United Kingdom.